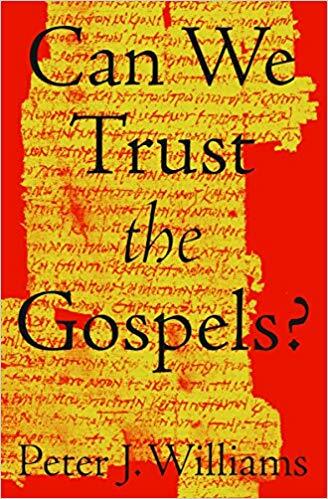 Book Notice: Can We Trust the Gospels? I recently received an advanced reader copy of the new book by Peter J. Williams, Can We Trust the Gospels? (Crossway, 2018). Peter is the Principal of Tyndale House, a study center (mainly focused on biblical studies) out of Cambridge, England. – It does not presuppose prior knowledge of the Gospels, even having a chapter entitled, “What are the Four Gospels?” Thus, it would be great to give to a new Christian or a non-Christian. – There’s an intriguing section on names we find in the Gospels and how those match the most common names we find in first-century Palestine. I’ve seen Pete deliver this material in lecture format, and I am pleased to see it made its way into the book. – There’s a helpful chapter on the way Jesus’ teachings were recorded, including some discussion on memorization and the relationship between John and the Synoptics. – And, of course, no book on the Gospels would be complete without a section on transmission and textual variations. This is an area of specialty for Pete, and proves to be a very useful little chapter. The Gospels―Matthew, Mark, Luke, and John―tell the story of the life and teachings of Jesus Christ while he was on earth. But how do Christians know if they are true? What evidence is there that the events actually happened? This accessible introduction to the historical and theological reliability of the four Gospels, written by New Testament scholar Peter J. Williams, presents evidence from a variety of non-Christian sources, assesses how accurately the 4 accounts reflect the cultural context of their time, compares different accounts of crucial events, and considers how these texts were handed down throughout the centuries. Written for the skeptic, the scholar, and everyone in between, this book answers common objections raised against the historicity of the Gospels in order to foster trust in God’s Word. The volume is due out November, 30, 2018. Congratulations, Pete! In ‘Jesus and the Eyewitnesses’ Bauckham devotes quite a few pages to names in the gospels and whether they match the historical record. Is Peter presenting the same material in this book, or is it different? Williams’ is much briefer and much more introductory. Blomberg’s is more full-orbed and geared for scholars, pastors, seminary students.